Cape Town - AB de Villiers is more confident in his role as a wicketkeeper/batsman for the Proteas' Test line-up, after nearly six months since taking over the position from Mark Boucher. De Villiers explained the difficulty of adjusting to the sudden change, but is happy with the role as long as it contributes to the team success. “It took me a while but I’m into a nice rhythm,” De Villiers via a statement released to the media on Sunday. “I had to adapt to a few things but I feel that I understand what my role is and I make time for both keeping and batting. De Villiers withdrew from the recent T20 series against New Zealand for extra rest, and says the down time has left him mentally and physically refreshed. “It’s all about managing your energy levels and niggles, ultimately about keeping the passion and hunger to do well for your team,” the Proteas’ vice-captain said. “We play a lot of cricket throughout the year and we are in a situation where we have to manage it (the workload). He broke his lean streak with the bat with an excellent century against Australia during the last Test match in Perth, and hopes to continue with that form at Newlands - where the Proteas haven’t lost a Test since 2006 - and into the New Year. “It was very satisfying,” he said about the 169 at the WACA. “It was nice to get the monkey off my back. Personally I needed to tell myself that I could do it. The doubt creeps in when you don’t perform because you have the gloves in hand and I knew that I was entering a new era of my career and I wanted to perform in a certain way, which I did in that innings. 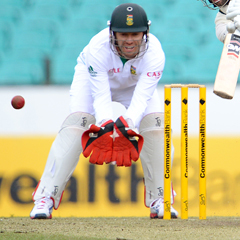 The Proteas have also set their goals for 2013, where they will look to stretch their lead at the top of the ICC Test rankings. The two-Tests series against the Kiwis starts at Newlands from Wednesday.